The Vinotemp VT-12TEDi iCellar wine cooler features innovative design that conveniently fits in any modern kitchen decor. 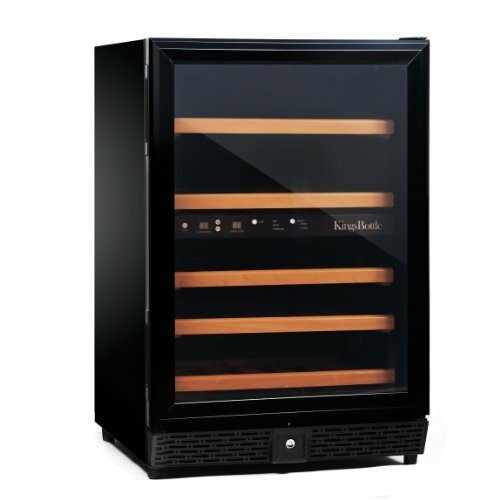 The Vinotemp iCellar stores 12 bottles of wine which makes it a good, affordable starting wine storage unit for budding wine collectors. Read a detailed review of the Vinotemp VT-12TEDi wine cellar to learn about its major strengths and possible weaknesses. 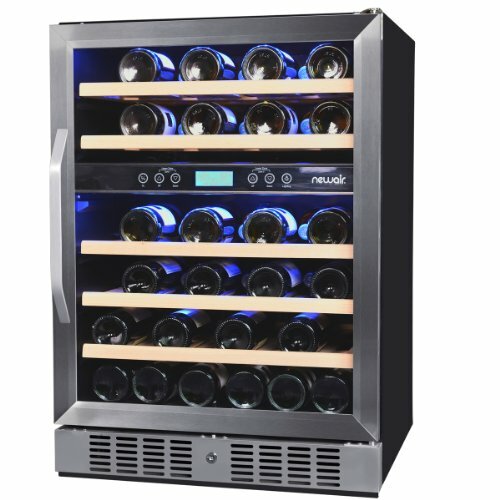 Vinotemp is one of the leading companies in manufacturing quality wine cooler refrigerators, wood wine cabinets, walk-in wine cellars, custom wine cellars and accessories for both residential and commercial use. The Vinotemp iCellar has a creative new design that differentiates the unit from other models offered by Vinotemp. The polished black and stainless mirror design of the cabinet lends an elegant look to the unit. The recessed handle adds a streamlined shape to the cabinet. Through the tinted, dual pane glass door you can view your wine collection. 3 scalloped chrome racks hold the bottles. The racks can be pulled out to access the bottles.The easy-to-use touch-pad controls and the bright blue LED display screen are integrated in the middle section of the door panel. By pressing the Up/Down arrows you can adjust the unit to cool in the range of 50ºF – 66 ºF (10ºC – 18 ºC). You can set the cooler to display cooling temperature in Fahrenheit or in Celsius.The control panel has light switch for turning on or off the soft interior light. 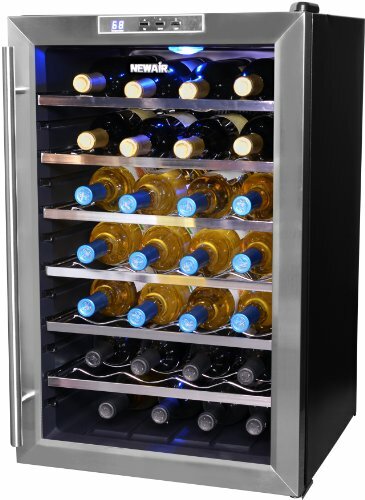 Like most small wine bottle coolers the Vinotemp VT-12TEDi iCellar uses thermolelectric cooling technology so it doesn’t contain a compressor which results in quiet operation. Another benefit of the thermeolectric (also known as Peltier) cooling is the lack of coolants (CFC-s, HCFC-s, organic compounds used in compressor-run fridges and identified to be responsible for the thinning of the protective ozone layer in higher strata of the Earth’s atmosphere). The cooler is meant to be used inside a home at 50 -80 ºF ambient temp., not in a garage or in a basement. Not all bottles will fit in – it accommodates only regular size and shape bottles (wider bottles won’t fit in) but it’s a common problem with other small capacity, cheap wine coolers. TIP: you can remove one of the shelves to make room for larger bottles. This is a freestanding model since it vents at the back. Provide at least 4 inches (10 cm) clearance at the back of the cabinet and 2 inches (5 cm) around the sides. This way the interior fan can effectively get rid off the warm air from inside the cabinet ensuring efficient operation. Adjust the leveling legs to level the unit. 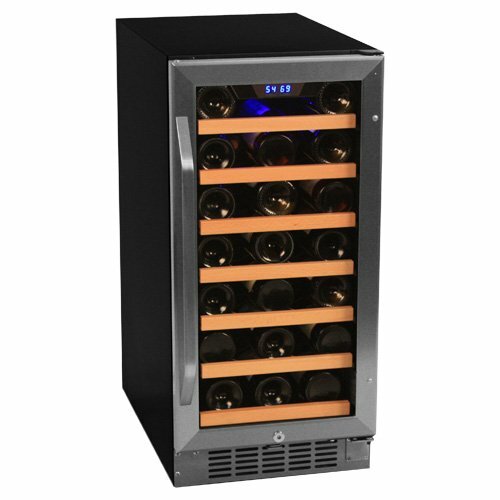 Price of the Vinotemp 12-bottle Thermoelectric wine cellar, Model VT-12TEdi: this inexpensive compact wine cooler sells for around $230-250. 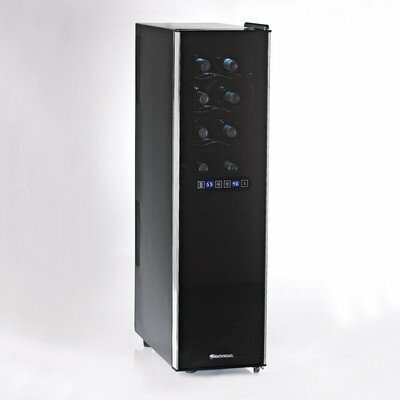 Avanti EWC1201 and Avanti EWC120B 12-Bottle wine chillers.